According to the Bureau of Labor Statistics (BLS), more than one million workers experience back injuries each year. One-fourth of all workers compensation indemnity claims are a result of back injuries. Low back pain is one of the most common reasons that people miss work, second only to the common cold. In America, we spend more than $100 billion annually in medical bills, disability and lost productivity at work from back injuries and illnesses. More importantly, this problem causes unnecessary discomfort and pain to workers which can have a devastating effect on their lifestyle and ability to work. A BLS survey shows that 75% of back injuries occurred while performing lifting tasks, which underscores the importance of reducing back injuries caused by lifting. Know what you are lifting and how you will lift it. Be aware of the weight of the object. Determine whether or not it’s safe to lift on your own. Make sure the work area is flat, dry and clear of debris. Make sure the lift pathway is clear. Remove any tripping hazards or debris. Check for any wet or slick surfaces. Use lift assists, forklift, dolly, cart, hand truck or hoist. Make sure you are trained before using the equipment. When lifting awkward or heavy loads, utilize a two-person lift. 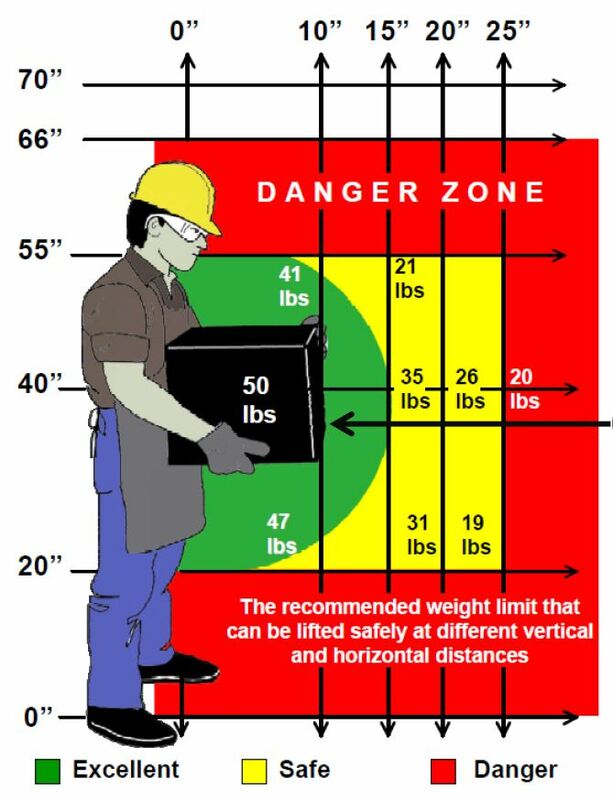 Make sure you lift at the same time and keep the load level. Wear proper required protective glasses, shoes, and gloves. Get as close to the object as possible. Use a wide stance with one foot forward and to the side of the object for good balance. Keep your back straight, push your buttocks out, and use your legs and hips to lower yourself down to the object. Slide the object as close to you as possible. Put the hand (same side of your body as the forward foot) on the side of the object furthest from you. Use this basic lifting technique for small objects when you can straddle the load and use a wide stance. Put the other hand on the side of the object closest to you. Your hands should be on opposite corners. Grasp the object firmly with both hands. Prepare for the lift, tighten your core muscles, look forward and upward, keep a straight and strong back. Lift slowly and follow your head and shoulders. Hold the load close to your body. Lift by extending your legs with your back straight, and breathe out as you lift. Know or test the object weight. Use ergonomic lift assists when possible. Plan the lift and clear your path. Get help for heavy or awkward loads. 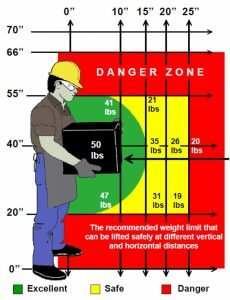 Keep the object in the power zone. Use a wide stance for balance. Use your legs to lift. Pivot your feet to avoid twisting. Don’t bend or twist at the waist. Don’t use a partial grip (1-2 fingers). Don’t obstruct your vision when carrying. Don’t jerk or lift quickly. Don’t pinch your fingers or toes. Don’t pull a load if you can push it.